Hard to believe a year has past since I was pestering you folks for some Jericho moose info. Needless to say Ron, Michelle, Bob and I had a great time. I was wondering what you folks have been seeing for moose? Any tip/suggestions, whereabouts, etc. much appreciated ! Oops, forgot to also ask, are the timber company folks still running chopping activities in or around the Park? Saw a cow moose on the Lake Loop trail on the other side of the Army Corp dam. Got off the quads and peeked over and there she was. You would cross thru it if you could go North on Snowmobile Trail 109. Thanks for the info Higgy. Stupid question #1 : Can ATV's travel on snowmobile trails in NH (like for example, on Snowmobile Trail #109 ? Stupid question #2 : Where can we get snowmobile trail maps for the area? ps. Did you ever get that taste of Michelle's moose chili ? Taken by my friend about 10 miles north of Jericho in West Milan. 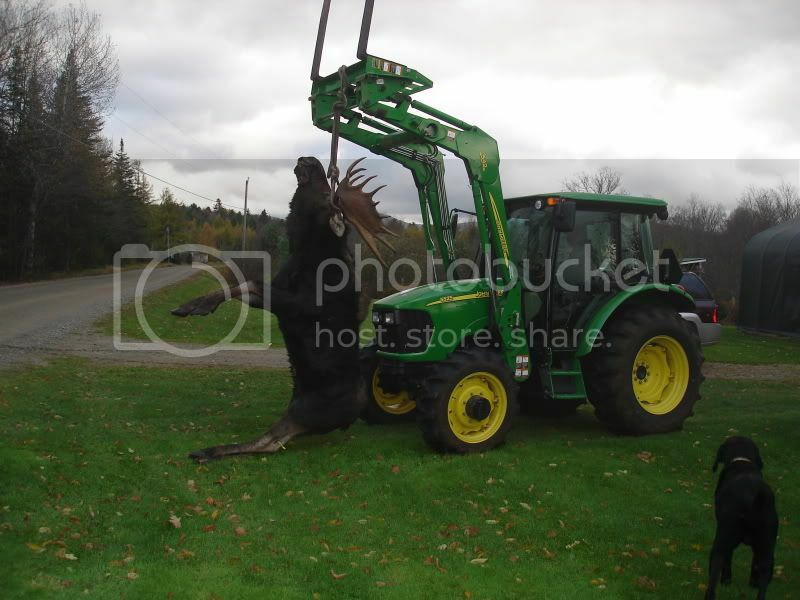 He said that he heard that 3 moose were taken in the Park opening day. The camp where he stayed was a bit closer to where he had also seen moose so he did his stalking there. Thanks to all for the advise and info again this year. Now that's the way to get a moose out of the woods. Saw some guys hauling out a bull this past Sunday in the park. Looked like a good size one but definitely not as big as that one hanging from that Deere! Congrats. just above his front hooves you will see my camp....small world after all!